But despite my protestations, it is true though: I am not a fan of plain, steamed white rice. • From non-Asian people, they look at me as if I just told them I was born with six fingers on one hand and the extra digit was removed at birth. At this point, they usually tell me how much they love rice. • From Asian people, they just ignore me. I don’t even think they hear the “don’t,” they just hear the “like white rice.” Because what Asian doesn’t like white rice? Inconceivable! Plain white rice was the bane of my young existence. As a child, it was always just giant piles of tasteless filler stacked in sticky, unswallowable heaps in front of me. My parents used to make me finish all of my rice before I was allowed to leave the dinner table. I used to drive them crazy by eating my rice grain-by-grain until they finally gave up and sent me to my room — which is all I really wanted in the first place. As I have gotten older, I have learned to eat it. Partly because it gives me something to chew on as I contemplate all the dishes spinning around the Lazy Susan. After really strong flavors, I have come to appreciate white rice as a palate cleanser. Also, a Chinese meal just feels incomplete without rice on the table, regardless whether I eat any or not. There is one way to always get me to eat my rice: fry it. It’s also traditionally topped with a fried egg, and who can resist fried food topped with more fried food?! Kimchi fried rice calls for a nice dollop of Korean red pepper paste, or gochujang. Gochujang is one of the most common condiments/ingredients in Korean cooking and as such, is fairly easy to find in Asian supermarkets. I think the problem is that there are so many brands of commercially-made gochujang that it can be a little overwhelming as to which one to pick. This is why I love this post from One Fork, One Spoon. As Diane and Grace point out, it’s hard to shop for Korean ingredients if you don’t speak Korean! I certainly don’t, and really appreciated their tasting notes and photographs of labels and brand logos. 1. In a large skillet, heat the butter and oil over medium-high heat until the oil begins to shimmer. Add the sliced hot dogs and the green onions. Cook the hot dogs until they are heated through and the green onions have softened. 2. Add the rice to the pan, breaking up any clumps with the side of a wooden spoon or a spatula. Evenly drizzle the sesame oil over the top of the rice and let it cook undisturbed for about a minute before stirring it. 3. Add the chopped kimchi and the gochujang to the skillet. Stir everything together until red pepper paste has been well-incorporated and the kimchi has been evenly distributed throughout the rice. Adjust the seasoning. Lower the heat and spread the rice and kimchi out in an even layer over the bottom of the pan. Let it cook for a few minutes until the rice has become nice and crispy on the bottom. Stir the pan again, scraping the browned rice off the bottom of the skillet. Adjust the seasoning for a final time and divide the fried rice into bowls. 4. In a separate pan, fry up one egg per person. 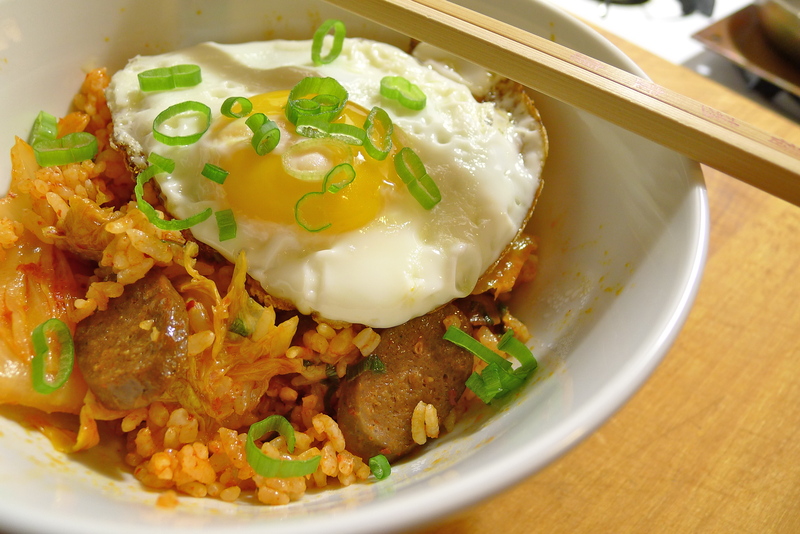 Top each bowl of kimchi fried rice with an egg. Scatter some chopped green onions on top and serve. I bought kimchi. I really like this brand called Mother In Law’s Kimchi. It’s so good, and I don’t think I’m brave enough to make my own! I can see why you wouldn’t want to eat hotdogs. Oh, man. That must have been a pretty shocking thing to come across for the first time! I will try it this week to go with Korean BBQ chicken I’m planning since I got my grill ready to go and the weather is warm…yay! That sounds like a winning combo! It seems as if we have swapped weather. Earlier this week, almost 80 degrees and sunny. Today, 50 degrees, pouring rain and gusty winds. The MidAtlantic is trying to kill me! That looks so great! I have been looking for an excuse to buy the kimchee at my farmers market and I see a new condiment in my future! I think it’s okay not to like plain white rice, I don’t. Delicious looking rice bowl! You don’t like plain white rice either? Hooray! I thought I was the only one! Top anything with an egg and I’m good. I agree! I think just about everything is better topped with a fried egg. It was! Fried rice always feels like comfort food to me. It was also nice and spicy! I love fried rice too. It’s my ultimate comfort food. It’s so easy to make if you have leftover rice from take-out or something lying around. You should totally try it! I can’t let my husband read this or he would divorce me and marry you in an instant. (He LOVES kimchi! Good thing I like it, too. :)) Bookmarking this to make for him soon! You guys should definitely make yourselves some kimchi fried rice though! Our weather has been so crazy. We had 79-80 degree weather, and then it dropped 30 degrees to 50! Kimchi fried rice was perfect for the colder weather. Something spicy to warm you up! I love hot dogs too! The ones we get from the CSA are really lean, so I have to be careful to not overcook them. I love knowing that there is nothing weird in them. But in all honesty, I even love me a dirty water hotdog from a street cart. I said that to someone once and they gave me this giant lecture on how bad processed food is and how I shouldn’t eat junk because it’s so bad for the blah, blah, blah blah. Seriously preaching to the choir. I’ve been the core member for a meat CSA for over two years! I probably know WAY more about sustainable food and farming than they do because my dissertation is about food! I really don’t like it when people get preachy. Don’t get me wrong, I’m not saying things like dirty water dogs are healthy, but I try not to get be precious about things I only eat once or twice a year! Ours are organic, all-beef hot dogs from Earth Fare–not to preach, though, ’cause I like a dirty-water street vendor hot dog every now and then, too! I did recently learn that we can get local, pastured dogs through Athens Locally Grown (our online farmer’s market), but we still had this pack in the freezer to use. I want to try the local ones soon! I agree with you about preachy folks. On one hand, eating locally and sustainably is so important to me. We don’t really buy mainstream processed foods except my yearly two boxes of Girl Scout Cookies (Samoas and Thin Mints! ), plus the occasional bag of chips (to go with our hot dogs! :)). But, in the end, it’s not going to kill me or the Earth if I eat some Cheez-Its sometimes, and I’m not going to turn my nose up at other people’s choices. That’s just rude. I would love to hear more about your dissertation sometime! I’m too chicken to go for a PhD myself, but I’ve got a healthy admiration for academia, and of course I like reading about food! God, I love those cookies too. I swear those Scouts peddle in crack because I can go through a whole box of Samoas without blinking. I thought the Samoas got renamed though because people were complaining that the name was politically incorrect? Renamed to something like Crack-Covered Cookies! I have this recipe planned for the weekend. Yay! And I also need to tell you something. Your blog totally rocks!!! And because it does I have nominated you for the Sunshine Award. Congratulations, marching bands and all that good stuff. YAY! I can’t wait to hear how the rice turns out! I already ate all my kimchi fried rice, so I will have to live vicariously through you! And thank you for the Sunshine Award too! I feel really lucky to have met such an amazing community of writers online — this means you! You are so welcome re the Award. And I shall let you know about the rice. Am pretty excited about it!!! Me too! Congrats and thanks again! Kimchi fried rice. With hotdog! And then you mention SPAM? Almost fainted. A kindred spirit. Heh heh. Every time I read your blog, I have this killer craving for Spam musubi. Is that weird? I also wonder what you think about plate lunch . . .
Ohhhh I love this SOOOO MUCH!!!!! I would call this the perfect stoner food except I’m not stoned and I want to eat it for breakfast lunch and dinner! So maybe it is the perfect food? It has EVERYTHING I like: spicy and tangy and fried and pickled AND a fried egg. I am going to buy some kimchi and gochujang and hotdogs this weekend! And eat this! By myself! Afterwards is usually a Taco Bell-White Castle-How-the-H***L-Did-I-Get-Here?! kind of moment . . . However, if someone not stoned would have made it for me, then it would have totally been perfect!!! It is hard finding unusual ingredients in New Hampshire but happily we do have kimchi. The kimchi is the most essential part! I bet you could probably make it without the gochujang too. Gochujang lasts for such a long time that if you get some, it will definitely keep! I’ll have to see if I can find the Gochujang. When I was little we lived next door to a couple from Singapore. She used to cook for us and said we had to eat up our rice because an old wives’ tale from that part of the world said that for every grain you left on your plate your future wife (or husband) would have a pimple on their face! I always eat all my rice! Ah. Seriously, that actually explains a lot! Thanks, Malou! I love fried rice too. It always makes me think of my mom, who makes wonderful fried rice. I love a fried egg over rice too! But, heck, I really love a fried egg over everything. I especially love a fried egg on top of pizza. The best! Kimchi is traditionally not made with Chinese, but Napa cabbage. Thanks for the comment! It’s napa cabbage in the recipe. My wife loves making Kimchi and we have several different kinds in our fridge right now (I’ll have to do a post on this topic sometime). I remember I did once add some to fried rice but I have to try your recipe! I am so impressed that you make your own kimchi! That is awesome. I have always been too scared to do it myself, thinking that I need some giant earthenware urns and a backyard to bury them in. That’s silly, right? Kimchi fried rice is pretty great! Do let me know if you try it! Yay! It looks like it turned out great!